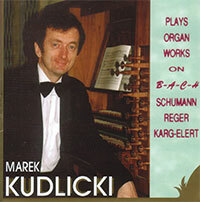 Marek Kudlicki is one of the few organists who earns his living almost exclusively from appearing in concerts. He tours the world constantly and has performed on every continent achieving great acclaim. He was born in Tomaszów Lubelski, Poland. He studied organ (under Prof. Joachim Grubich) and conducting (under Prof. Krzysztof Missona) at the Academy of Music in Cracow. He completed his diploma with distinction. It is noteworthy that he began his musical career while still a student, by giving concerts and recitals in many cities of Poland. In the summer of 1973 he took part in the master course in Mechelen (Belgium) taught by Prof. Flor Peeters, the noted interpreter of Cesar Franck’s organ works. He continued his postgraduate studies with renowned organist, Prof. Hans Haselböck at the Vienna Academy of Music. 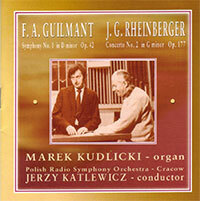 Marek Kudlicki won the First Prize (and the Special Prize of the Polish Ministry of Culture and Art) in the Organ Competition in Poland in 1973. For many years he has been actively engaged in artistic activities as is evidenced by the many concerts he has given in almost all of the European countries and many times in the U.S.A. and Canada, as well as in Australia, New Zealand, South Africa, Colombia, Argentina, Mexico, Hong Kong, Japan, Malaysia, Singapore and Taiwan. He has often appeared at international festivals as performer and judge for organ competitions. His numerous performances have been presented in conjunction with well known concert series in various music centers (Stockholm, London, Vienna, Sydney, Wellington, New York, Minneapolis, Bogota, Buenos Aires), as well as at renowned concert halls (Cracow Philharmonic, Cracow; Sala Luis-Angel Arango, Bogota; Cleveland Museum of Art, Cleveland; Sejong Cultural Center, Seoul; Roy Thompson Hall, Toronto; Hong Kong Cultural Centre, Hong Kong; National Concert Hall, Taipei). 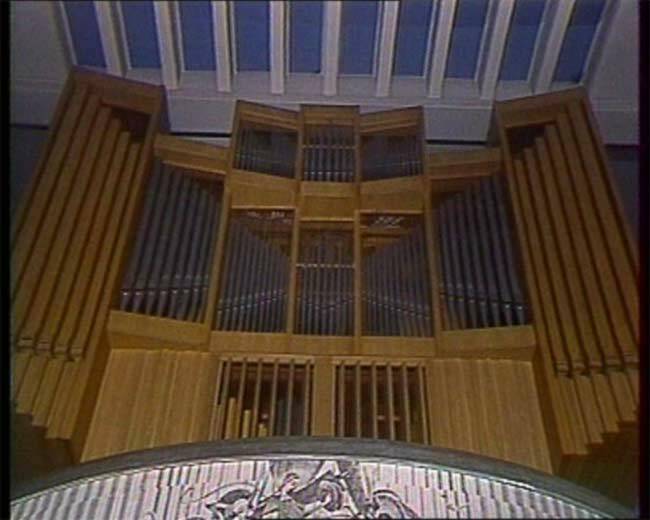 In 1985, 300th anniversary of J.S.Bach, Marek Kudlicki was invited to perform on the largest organ of Asia in the International Festival in Seoul, Korea. 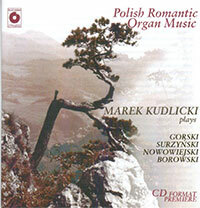 Marek Kudlicki regularly promotes Polish organ music in his programs. He routinely includes works of native composers in his recitals and in his recordings. He has given lectures at various universities on different continents. a celebratory recital at San Francisco’s Grace Cathedral. He has recorded extensively for the state radio stations in Poland, Italiy, Switzerland, Austria, Norway, Iceland, Radio Hilversum, Radio New Zealand, Radio Suisse Romande, National Public Radio - U.S.A., South African Broadcasting Corporation, as well as for several TV and record companies. Marek Kudlicki’s repertoire is extensive. It encompasses works of all periods, including early, romantic and contemporary Polish organ music. Apart from solo works, he has in his repertoire numerous and seldom played pieces for organ and orchestra. He has performed these works with various orchestras throughout the world. In his many years in the profession he has often complemented his appearances as an organ soloist with his activities as a conductor. ...Polish organist Marek Kudlicki, well partnered by the Singapore Symphony Orchestra, encompassed this multi-faceted score (Poulenc, Concerto) with confidence and technical finesse. The fast sections bad a fitting sense of exuberance and power, while the soft coda was tinged with gentle sadness. The balance between organ, timpani and orchestra was excellent. ...The concert by this young Cracow musician impressed me most and is firmly established in my memory. I was enchanted by his ripe, concentrated dashing playing and his taste for the right organ stops to express in a clear, subtle and brilliant way his sensitivity for the beauty of organ sound. One can certainly say that somebody truly distinguished in organ virtuosity was playing here. ...The highpoint of the concert was the seldom played Prelude and Fugue in g minor by Johannes Brahms. 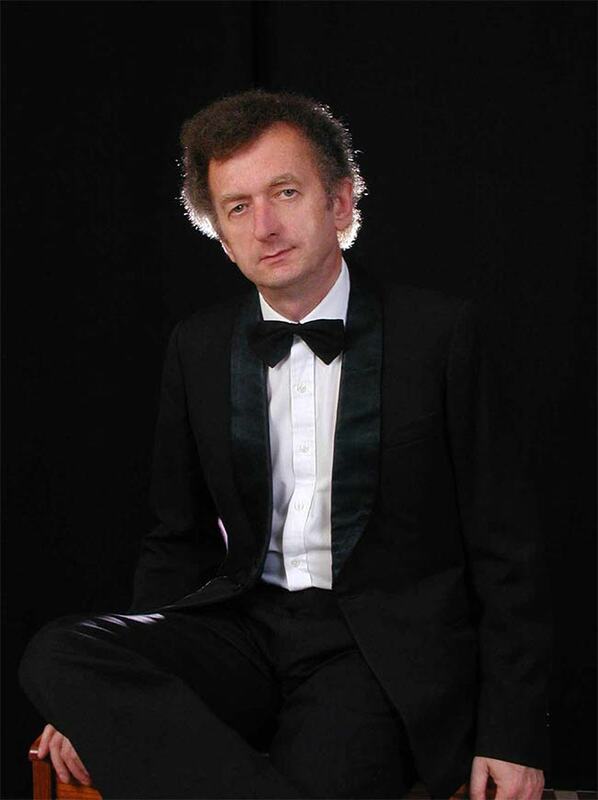 The virtuoso joy of playing and the energetic toccata figuration found an ideal interpreter in Marek Kudlicki. An harmonic nuances were made clear through clever registration, and his considerable manual and pedal technique were put to good use. ...His expression was reached through precision, by presenting the dynamic shading of each work with a transparency of phrasing, resulting in a strong architectural picture of the compositions. The overall effect of his performance was natural and well-balanced, fully realizing the colourful possibilities of the organ. ...Kudlicki - Fantastic Organist From Cracow ...It was a great pleasure to study his technique of playing, which emitted such beautiful music. Kudlicki's playing offered not only technical perfection, but also profound interpretation with artistic intelligence, profiling the different works. ...A World-class Organist in Elverum Church ...Marek Kudlicki is a tremendously selective organist. His fingerwork is clear and precise. He pulls his stops according to a carefully worked-out plan, thereby lending a great range of colour to the music performed. ...One of the Greatest ...Marek Kudlicki gave concert of romantic organ music and it was soon apparent that a master organist was performing. As the concert went on, one became more aware of the soloist's capacity to express the romantic style, making the music come alive through the necessary amount of freedom and feeling. In a time when organ music tends to be so mathematically exact, this is a welcomed change. ...A compositional rarity was also performed, namely a group of dance movements from the Tablature Book of Jan of Lublin. The special way that Marek Kudlicki adapted this music to the organ in Oberkirch, plus his convincing performance, displayed as well his historical knowledge. …Marek Kudlicki’s virtuosity became evident in full magnificence finding a superb partner in the orchestra. The audience, after a long applause, was rewarded by an encore of the second of the effective finale of this work (Rheinberger, Concerto in g minor), which we would hear with pleasure some time again in the Lodz festival. ...Organist Thrills in Rare Recital. ..The appearance of the young Polish organist Marek Kudlicki at St Mary's Church, New Plymouth, on Saturday night was a special event, and it was worth waiting for. ..."Fantasy" by K. Gorski is quite distinctly romantic in mood with a contrapuntal touch reminiscent of Mendelssohn, and again it was presented with assurance and a real sense of style. ...Since the organ of Wollongong City Hall was installed about 15 years ago, there have been about 200 performances of varying standard. 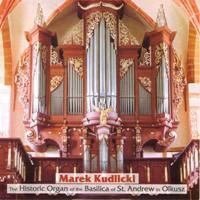 Marek Kudlicki must rank as one of the very fine organists that have performed here. ...He readily demonstrated his remarkable interpretative talents in the works of Bach in the first part of the program. These he played with precision and musicality without the strident tones and reverberations that one hears from many other organists. ...Marek Kudlicki performed the works of his compatriots with technical assurance and intensified their musical charm by sometimes contrasting them sharply in sound coloration or by sudden changes in tempo. His performance seemed out of effect throughout, though never merely external or shallow. ...Kudlicki - Brilliant Master ...The crowning finale was provided by Jacques Ibert with "Trois pieces" showing an admirable musical structure and extensive phrasing including complex fugus, in which Kudlicki demonstrated brilliant mastership. The genial Polish guest dared the listeners to grapple with mostly unfamiliar compositions, but rewarded him with faultless interpretations and joys in sound, maintaining a high level in his choice of works. 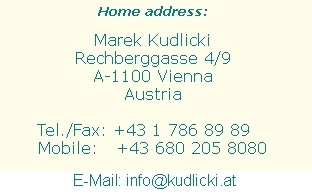 ...Kudlicki seems an objective and faithful interpreter, but his objectivism has its proper limit. One senses an unwillingness to go beyond a composer's intention, but equally a desire to present the music played in a rich style yet in keeping with the spirit of the period. ...Kudlicki Pulls All Stops of His Art ...Polish organist fascinates ...Apart from gratitude for an extraordinarily informative program in its density, it was the fine sense of colourful sound on the part of the Polish guest, seemingly inexhaustible in making use of all changes of registration, their transparency and juxtaposition, which in addition to superior manual and footwork and ever lucid density of form caused the spontaneous applause of the audience. 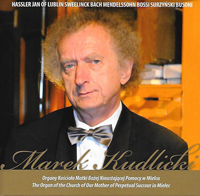 ...Kudlicki is undoubtedly an organist with a symphonic concept ...He is a virtuoso of the instrument, attains a maximum of purity in spite of the reverberation of the nave and is master of contrasts. ...Excellent Mastership in Unity ...Alexandre Guilmant's "Symphony for Organ and Orchestra" is unabashed mass-pleasure. 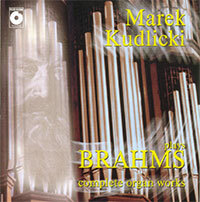 The Polish organist Marek Kudlicki has offered the work with panache ...Kudlicki's musical versatility is impressive. He possesses an outstanding technique, even in an ardent solo passage of restless footwork. That the audience has cheered him so enthusiastically tells nearly the whole story about the music itself and his interpretation of it. ...Dating from October 1983, this recording is thanks to a young virtuoso who offers honour with talent to the very musical tradition which nourished it, and to the producer who is not scared to leave beaten tracks. The romanticism of the organ, so perfectly suited to the ensclaved soul finds a deep moving expression in this album. ...A Great Concert at the End of the 19th Organ Festival ... "Piece heroique" Op. 128 by Enrico Bossi played in the second part of the program, became a gala of virtuosity of the Polish organist. Marek Kudlicki offered a fine concert of high quality ...He got the very best out of the organ, showing his mastery of registration. …Does the reviewer seem to have exhausted his store of superlatives on Marek Kudlicki’s account ? Listen for yourselves to this outstanding interpreter and form your own opinion. However, as one who has studied the contrapuntally-inclined organ music of 19th-century Germany in quite some depth for over ten years, this reviewer says with candoe that a recording of such calibre is a rarity and more than worth acquiring. Bravo et Gratias. ...Kudlicki Wins Appreciation ...Kudlicki gave a persuasive, finely balanced rendition of Scheidt's Variations "Ach du feiner Reiter". He played with unflagging sensitivity, each line carefully phrased to produce a fresh and direct performance ... Mozart's K 616 Andante was written for a small organ - the piece had a lovely bell-like clarity which Kudlicki exploited to the full.